Theresa May and Xi Jinping taking part in a traditional tea ceremony in Beijing. The two world leaders have announced a joint trade and investment review. Formal free trade talks can't begin until the UK officially leaves the EU next year. May's trip is part of Britain's bid to reinvent itself as a global trading nation after the 2016 Brexit referendum. China's vast economy would be a welcome partner. 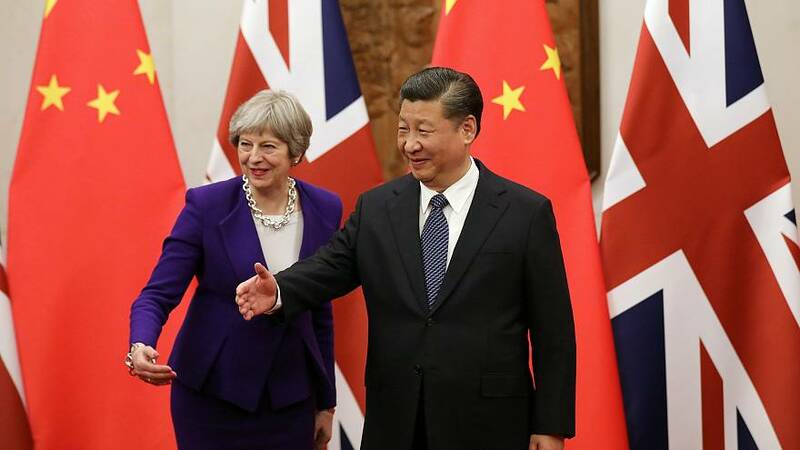 "The prime minister taking a large delegation to China is a positive step," says Edwin Morgan, Director of Policy at the Institute of Directors in London. "We'd like to see much more of these; we'd like to see more going out to the rest of the world and bringing it back to the UK. We're going to have to ramp up a lot the trade promotion that we do because it's going to be very, very vital after Brexit". "We are facing the current state of the UK's exit from the European Union, but just as history has been, our relationship will not change because of changes in Britain-Europe ties". May says that British companies will sign more than 10 billion euros in deals during this trip. "Sorting out our relationship with the EU is the most important thing right now. Only once we've got that pinned down, then we can decide which markets to target for new trade agreements. The EU first, then the rest of the world". On Friday, May will visit China's financial hub, Shanghai, before heading back to London. Why must Brexit talks move onto trade so urgently?